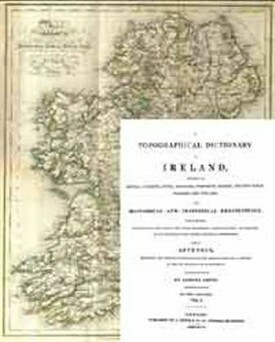 Lewis's Topographical Dictionary of Ireland is the first detailed study of its kind for Ireland. It was published in 1837, before the Famine (1845-50), so it is very important for historians and genealogists of the early nineteenth century. Ballinrobe, a market and post-town, and a parish, in the barony of Kilmaine, county of Mayo, and province of Connaught, 14 miles (S. by E.) from Castlebar, and 116 1/2 miles (W. by N.) from Dublin and contains 8,923 inhabitants, of which number 2,604 are in the town. A monastery for friars of the order of St. Augustine was founded here some time prior to 1337, in which year it is mentioned in the registry of the Dominican friary of Athenry, under the name of the monastery of "de Roba." 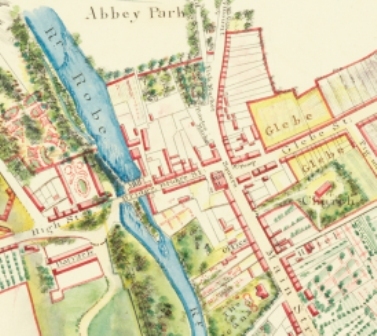 The town is situated on the river Robe, from which it derives its name, and on the road from Hollymount to Cong; it consists of one principal street, from which two others diverge, and, in 1831, contained 441 houses, of which nearly all are well build and slated, and several are of handsome appearance. There are barracks for cavalry and infantry; the former adapted to the accommodation of 8 officers and 106 non-commissioned officers and privates, with stabling for 84 horses; the latter for 6 officers and 96 non-commissioned officers and men, with a hospital for 20 patients. A considerable trade is carried on in corn; and large quantities of wheat and potatoes, the latter of excellent quality, are sold in town. There are a large flour-mill, an extensive brewery and malting establishment, and a tan yard, all in full operation. The market is on Monday, and is well supplied with corn and provisions; and fairs are held on Whit-Tuesday and the 5th of December, chiefly for sheep and cattle. A chief constabulary police station has been established here. There is a patent for a manorial court, but none is held; petty sessions are held every Monday, and general sessions take place in June and December. The courthouse is a neat building well adapted to the purpose, and affording also accommodation for the market. The Bridewell contains four cells, three day-rooms, and two airing yards, with other requisite accommodations. This page was added by Averil Staunton on 03/06/2011.